The Old Town Inn is a certified TripAdvisor GreenLeader, and we’ve made changes to become more eco-friendly while providing an excellent guest experience. We view conservation as a partnership. By working together, we can reduce waste and help protect the environment, goals we can all feel good about! Our hotel uses 100% Green-powered electricity (a mix of hydropower, biomass, wind, and solar energy). We have a comprehensive recycling program that includes in-room recycling, lobby recycling and back office recycling. We compost year-round to keep our food waste out of the landfill. We collect all our non-rigid plastics (plastic wrap, bagel sleeves, Ziplocs, etc.) and give them to a company that makes high-quality plastic decking. We use a wide variety of eco-friendly products. All of our breakfast ware is recyclable, made from renewable resources, or made from 100% post-consumer recycled content. Also, we strive to use as many green cleaning products, soaps and detergents as possible. All of our paper products (toilet paper, tissue, printer paper) are made from recycled content. We proudly serve Camp 4 Coffee. It’s local, organic, and it’s our favorite coffee in town! 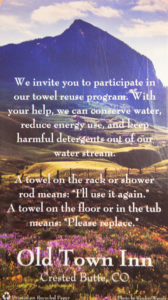 We’ve implemented a linen and towel re-use program throughout the hotel. By not changing linens and towels unless directed to, we’re reducing our water and energy consumption, as well as reducing the amount of detergents entering our water stream. We’ve switched every incandescent bulb in and around the hotel to either Light Emitting Diodes (LED) or Compact Fluorescent Lights (CFL). We’ve partnered with Clean the World to recycle unused portions of soap, shampoo and lotion. This program diverts waste from the landfill and provides disease-fighting hygiene products to impoverished areas around the world. We track our monthly energy use to constantly monitor the efficacy of our energy-saving efforts. We use ladybugs and other natural methods to prevent pests in our beautiful gardens, allowing us to avoid harmful chemicals. Use in-room recycling bins and the recycling bin in the lobby (cardboard can be brought to the front desk for recycling). You can recycle the clear juice cups and black cutlery during breakfast. Turn off air conditioning/heating unit while away from your room. Bring compostable items to the office. Limit the length of your showers. Choose not to replace towels and linens daily. Unplug all electronics when not in use (including chargers because they use electricity even with nothing attached to them). Turn off all lights while away from the hotel room.